Washington, DC is home to the International Spy Museum, the only spy museum in the United States. The popular attraction showcases more than 200 gadgets, weapons, bugs, cameras, vehicles, and technologies used for espionage throughout the world. Exhibits feature stories of real spies, their missions, their fates, and how their espionage affected some of the most pivotal moments in world history. Visitors learn about the stories of individual spies throughout history, from Moses to Harriet Tubman, Elizabeth I to George Washington, Cardinal Richelieu to Joseph Stalin. Most visitors spend about two hours touring the general exhibition. The International Spy Museum is privately owned and operated and charges an admission fee. It does not receive government funding. The museum offers lectures, films, book-signings, and family activities covering a wide range of spy-related topics. There is a museum store offering unique gifts, books, maps and prints; a wide range of spy-related toys and educational products; pop culture merchandise and much more. 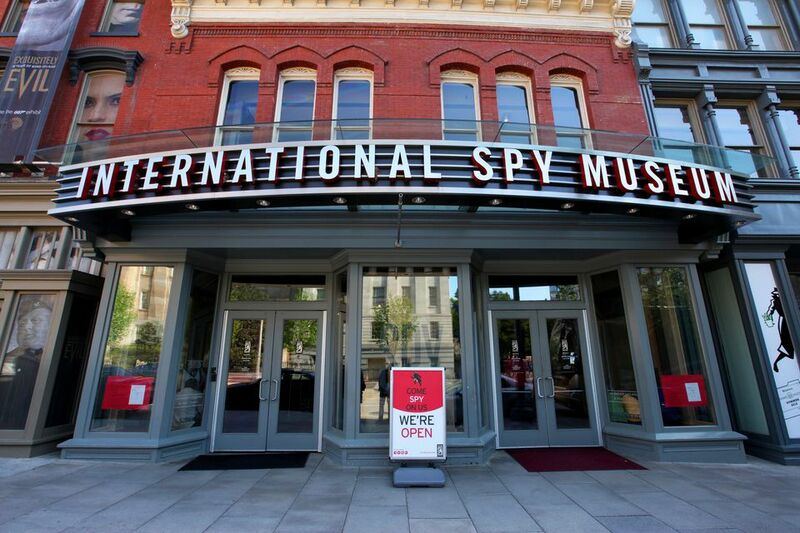 The International Spy Museum has announced plans to relocate to a new location to add additional space for exhibit areas, a new café and retail store. The new museum will be located at 900 L'Enfant Plaza in SW Washington DC.The building, designed by London-based Stirk Harbour & Partners, will sit in front of the glass atrium in the middle of L'Enfant Plaza facing 10th Street SW. The existing museum will remain open at its F Street location until the project is complete. Arrive early in the morning or later in the afternoon to avoid crowds and lines. During peak season, purchase tickets in advance. While children of all ages are welcome, the museum is geared to ages 10 and up. Check out the Family Missions Guide and enjoy some top-secret missions together. Groupon Washington DC sometimes offers discounts to the International Spy Museum. Permanent Collection - The permanent exhibition presents the tradecraft of espionage through the stories of individuals and their missions, tools and techniques. Exhibits include: School for Spies providing an introduction to the world of espionage and describes many of the skills and tools essential to a spy; The Secret History of History chronicling the history of spying from biblical times to the early 20th century; Spies Among Us showcasing real-life spy stories; War of the Spies exploring the Cold War, using Post-war Berlin as the backdrop for engaging exhibits detailing the Berlin Tunnel, the Stasi, the internal security force for East Germany’s Ministry for State Security, and the fall of the Soviet Union; The 21st Century examining challenges facing intelligence professionals world-wide in the 21st Century are addressed in the Museum’s final film, Ground Truth. The looming threat of Cyber War is addressed in Weapons of Mass Disruption. Operation Spy - In an action-packed hour, participants take on the role of U.S. intelligence officers on an international mission to locate a missing nuclear device before it falls into the wrong hands. This intense experience combines live-action, video characters, themed environments, special effects, and hands-on activities. Spy in the City - See Washington DC through the Eyes of a Spy. This interactive gps-based outdoor walking mission allows you to solve a spy case on your own. Your spy skills of observation, evasion, and code-breaking will be put to the test. 800 F Street, NW, Washington, DC. The International Spy Museum is located in the Penn Quarter neighborhood, a revitalized arts and entertainment district of Washington, DC. The closest Metro station is Gallery Place/Chinatown. To control crowding, tickets are assigned an entry time. Purchase tickets online. These exhibits can be very crowded even with the assigned entry times. The best time to visit this museum is during the week and early in the day. The Museum is closed Thanksgiving Day, Christmas Day, and New Year's Day. On occasion, the Museum closes for private events. Call (202) EYE-SPYU for up-to-date information.